The 1909-O Indian Head Half Eagle was the last gold coin from the New Orleans Mint. In 1908, the Indian Head theme of Bela Lyon Pratt was introduced on the quarter eagle and half eagle. The design was unique in American numismatics in that the coin features were incuse, (i.e. indented) into the surface of the coin, rather than elevated above, as were all other US coins. The New Orleans Mint was the last of the three southern branch mints established in 1838 to remain in service. No on has been able to determine why a small mintage of 34,200 half eagles was struck at New Orleans in 1909. Perhaps someone knew that was to be the final year of production and decided to give the historic facility a final hurrah. As such, the 1909-O Indian Head Half Eagle is a rare gold coin key date of high interest to collectors. It is by far the lowest mintage in the Indian Head Half Eagle series of 1908-1929. As the popularity of the 1909-O continues to increase, so does its price. The chart below illustrates the impressive percent value increase of the 1909-O over a period of many years. More than a century later, the final gold coin of the New Orleans Mint has earned everlasting fame in the eyes of numismatists. Could it be that is what they at the Mint had in mind when they fired up the coining press one last time? The 1909-O Indian Head Half Eagle has a long record of stellar price increases. The blue line above illustrates the percent increase in value since Jan 2000 of the 1909-O Half Eagle. 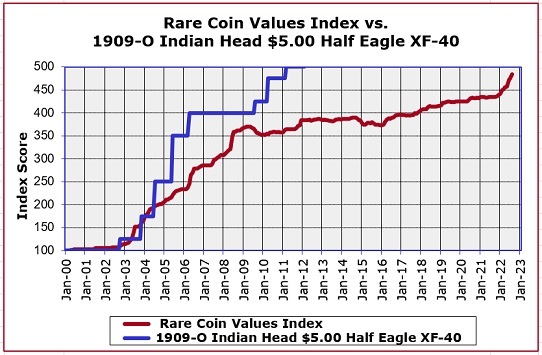 This compares favorably to the Rare Coin Values Index, as charted by the red line. The Index measures the percent value increase over the same time period of a representational group of US rare coins. The objective of the Index is to give us a feel for the strength of the overall market for US rare coins. The 1909-O Half Eagle is one of the 87 coins that make up the Index. All Index data is updated monthly.